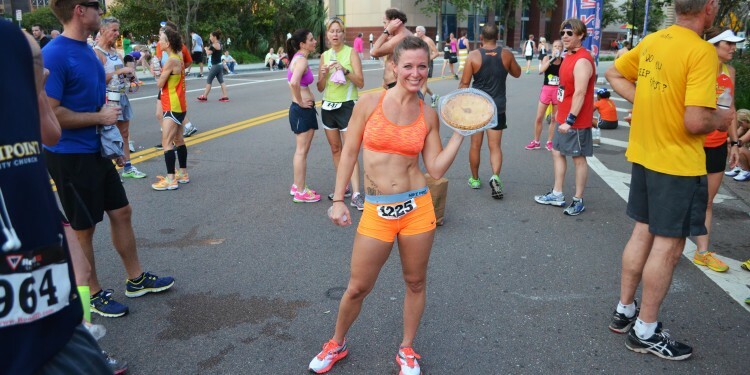 If you’ve ever run in a Florida mudrun or obstacle course race (OCR), there’s a good chance you’ve seen Erin Dankworth. She has competed in over 50 OCR’s in the past year and has become a household name amongst competitors in the sport. During the week she is the Director of Group Fitness at the Yates YMCA helping members achieve their goals but when the weekend hits, it’s time to get dirty! Jacksonville, Miami, Tampa, Waldo, if there’s mud and running you’re either gonna see or hear Erin tearing up the course! A couple months ago we spotted Erin at the Never Quit Race. She was pushing one of her clients from YMCA across the finish line, Deborah Anderson. She had been training for the event but after breaking her foot a couple of weeks prior to, wasn’t able to compete. Erin didn’t let that stop Deborah from crossing the finish line though. 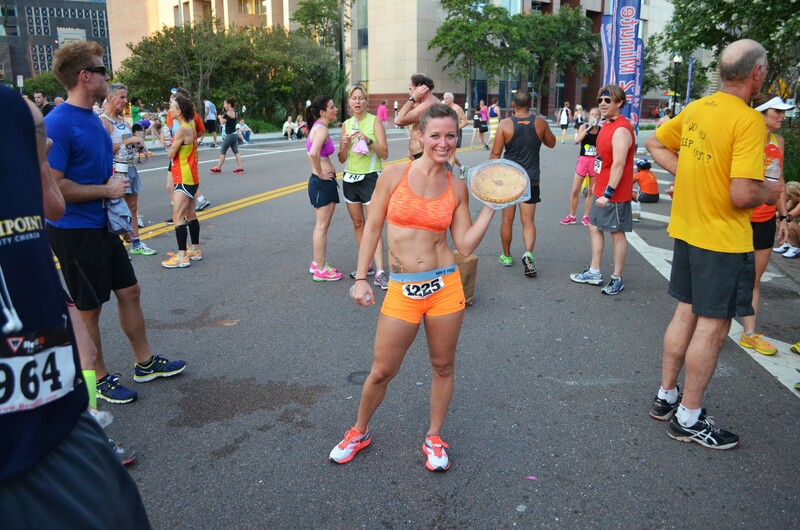 Erin isn’t just a great athlete but is also passionate about making sure the people around her know how great they are too and that’s why Erin “The Dank” is one of 904’s Fittest. Erin, in the women’s division, you’ve won or placed in every single obstacle course race (OCR) that you’ve ever run, do you have a secret weapon? My two daughters, Petra is 5 and starts Kindergarten this fall and Sienna is 3. They are close as sisters should be but their personalities are worlds apart. They are my world and I cherish their sweetness and innocence every single day. I focus on their faces each time I step up to the plate. And when I get desperate, tired, doubtful, or when I feel like I just can’t finish, I actually vocalize or yell out their names as I am running. Some of the best races I have had is when I have had to do that. Not long ago you were just doing street races, how did you first get into obstacle course racing (OCR)? I was introduced to OCR through a fellow street racer and current team mate in July 2012. He knew I was quick on the streets and strong in the gym, so he figured it would be a good thing for me to try. So, I went and ran my first OCR race down in Waldo and wound up winning second place female overall. I walked away with $500, a new team, and a new set of goals placed in front of me. I used to think OCR was going to phase out to an extent and that there were too many but that doesn’t seem to be the case at all. It has become a sport all in itself. Where do you see the sport going in the future? OCR has become huge! They are drawing the attention of athletes everywhere for so many reasons. Cash prizes, outstanding trophies and medals, bigger, better, harder obstacles and just holding a title of who is the best around. OCR also makes their athletes and winners known now. We are appearing in advertisements, posters, the internet, sponsorships are being handed out and our names are being thrown out there as a challenge to bring in more competition. Races are popping up everywhere and some of the biggest names around (Rock on Adventures, Hog Wild, Monster Challenges) are joining forces to host a race series or one huge race in itself. The trails are getting longer, the mud is getting thicker and the obstacles are getting harder. Out of all of the races what was the most difficult obstacle for you? A lot of obstacles are difficult for me because of my short stature but fortunately, I don’t have a whole lot of body weight to throw around. With OCR you learn technique and approach. There’s always a proper approach to any obstacle, a smart way to complete it. It isn’t necessarily all about strength. But, if I had to choose a hardest obstacle, I would say the gladiator rings. If you’ve ever seen the old school American Gladiator TV show, you know what I’m talking about. It’s just a huge pit of hanging gymnast rings where you swing from one side of the arena to the other. I haven’t quite perfected the technique on those yet! Do you have a favorite race, one that you just can’t wait to do again? It’s really hard to say! Each and every race is so different and unique. They have all become so creative in creating the obstacles recently. That’s part of the fun with OCR, there is always something new, different and exciting each time. It’s not like a street race where you’re staring at the pavement the whole time knowing what to expect. So, I can’t really say I have a favorite because they all vary in so many ways. I can say for certain though, that the most challenging and the one I will definitely do again is Mudzilla! For those who might be a little intimidated thinking about doing a OCR, is there one that you’d recommend to ease them in? There have been a couple of local races that are great for first timers or anyone who may be a little intimated. Mud Crusade, FL. ROC, The Boselli Foundations Mudfest, Mud Dogs… those are all great races to begin on. How do you train to prepare for an OCR? Like I said, although there is a fair amount of strength involved in OCR, there’s much more to it than that. It’s about stamina and endurance. It takes a lot to “stop and go” over obstacles when you’re racing through trails, water and mud. It also involves proper technique, executing things wisely, being smart, and taking your time! Most people want to fly through the obstacles when it is quite the opposite, that’s how people get hurt. There’s no sense in risking an injury or the possibility of not completing an obstacle the first time by rushing. Be the fastest on the course but be the slowest over the obstacles. And what I mean by that, is stop, breath, concentrate, execute. So, with all that being said, a lot of my training comes from my prior street racing (keeping the speed), training runs, and a lot of quick resistant and body weight training. I’ve always believed that you can be your strongest at everything with body weight training. There is so much we can do with our bodies that make us strong. Squats, jump squats, lunges, jump lunges, pushups, pull-ups, dips…. they are all great tools to use. They can increase the heart-rate for an extended amount of time while building overall strength. I also love the kettle-bells! For women in Florida you are ranked at the top but do you ever race on a team or have a training partner? I absolutely have a training partner! My fiance, Joshua Lackowski, has been training with me or training me (he is a personal trainer as well) since day 1. He’s taught me to climb unknotted ropes, get up a Solomon’s ladder, (which btw if you’ve never done one is tough!) he’s built incline monkey bars in his facility FOR me. In the beginning it was one of the tougher challenges for me in these races. He has helped me accomplish so many goals in the past year and has been there to support me at each and every race. He’s never missed a race and he has never NOT told me how proud he was of me. He’s challenged me, he’s pushed me and he has encouraged me each and every step of the way, even when I had nothing but doubt at the starting line. He’s always there with me when the gun goes off. We are both actually part of a large OCR team that races at all of these events as a whole. We register as a team but race as individuals within that team. The founder, Damion Trombley picked me up and I have been with and represented MUDRUNFUN since my very first OCR in July 2012. Team MUDRUNFUN also has a couple of Elite teams, both on the male and female sides. During certain races I compete as part of an Elite women’s team of 4 (the Cherry Bombs) as well as an individual.